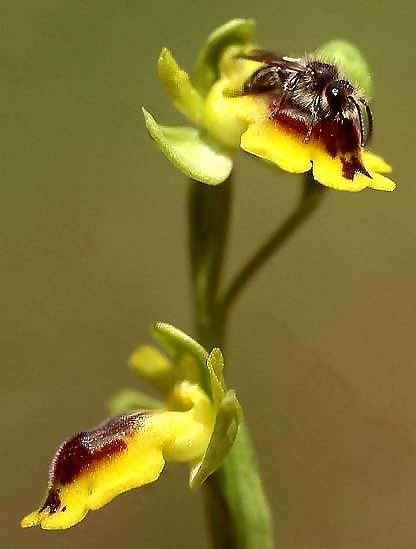 One of the reasons that orchids are so interesting is that they have some pretty interesting strategies for getting themselves pollinated, including playing some neat head games with bugs. In Europe, there is a species of orchid growing wild that is called ophrys, and it uses a pretty heartless technique to attract pollinators — a technique designed to waste the time of love-lorn wasps and bees: Pseudo-Copulation. These flowers are the ultimate sexual cheats of the floral kingdom. Each species of ophrys woos a particular variety of bug, using pheromones and a bloom that looks remarkably like a hot little female. Eager and wily, the blooms come out at the same time that the males emerge in the spring, just before the females. The males do their rutting thing, and end up with pollen sacs stuck to their bodies — at which point they figure out that they’ve been duped and fly off in a huff. Not even a snack of nectar for their troubles. Being males, hormones cancel out all rational behaviour. The next time they come across a fancy little ophrys waving its bloom in the air, it’s party time all over again. 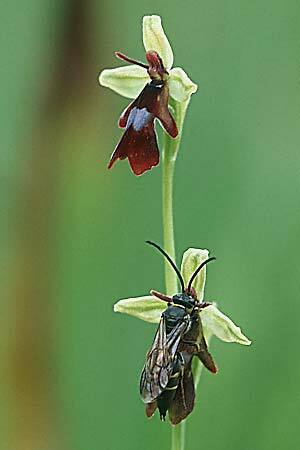 Thank you very much, the now-pollinated ophrys says to the bug, don’t forget to close the door on your way out. The funny thing is, some of the young and more inexperienced bees come to prefer the easy company of flowers than females of their own kind. It takes a seasoned and wise old bug to choose a real woman.